Spotify built its empire on the back of music streaming, but it is recently experimenting with non-musical forms of content as well. The app already carries exclusive videos, but is today introducing ‘Archie motion comics’ into the mix as well. 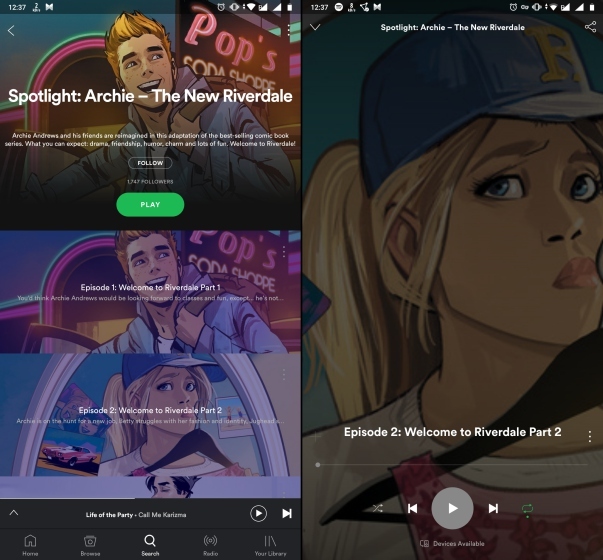 As reported by The Nerdist, Spotify has teamed with the team behind the new Archie comics to bring your much-loved storyline to life with a six-episode video series. The music streaming giant has partnered with digital comics startup Madefire to turn the first six volumes of the comic into motion comics, with music and animation that’s been topped off with voice acting. The title of the new Archie motion comics may resemble the popular Riverdale TV show that’s currently running on Netflix but the storylines are different. The new comics have been brought to life by writer Mark Waid and artists Fiona Staples, Annie Wu, and Veronica Fish. Being able to reposition these modern classics for new readers in this unique, motion comic format [on Spotify] makes perfect sense and we can’t wait for fans to experience these beloved Archie stories in a new way. The first six episodes are now available in the Spotify app. You can search for ‘Archie – The New Riverdale’ on Spotify or follow this link to check out this six-episode Spotlight featurette. Each of the episodes is about ten minutes in lengths and there’s no doubt you are going to have fun reading through the comics (even though it goes a little fast) after hitting play. So, if you’re an Archie or Riverdale fan, I recommend you to check out the motion comics on Spotify. And don’t forget to share your experience with us in the comments below.